A pulse oximeter is not only beneficial for emergency and in-patient care but is also a useful tool for out-patient care as well. Those who may find a portable pulse oximeter necessary may be patients with chronic cardiac and respiratory issues, patients with other varying medical conditions, people who have sleep apnea or trouble breathing during their slumber, pilots flying an aircraft where additional oxygen is needed, and even athletes who may experience decreasing oxygen levels due to strenuous exercise or high altitudes. Generally, it’s for anyone who needs to keep a close eye on their blood-oxygen saturation levels, and the Concord Basics Finger Pulse Oximeter does this and more. 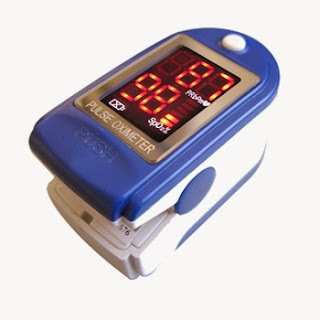 With a large screen, this Concord portable pulse oximeter clearly displays your blood-oxygen saturation percentage at the bottom and your pulse rate at the top. The bright red LED screen makes the oximeter easy to read any time throughout the day, whether you’re monitoring during the light of day or the dark of night. Everything you need is labeled on the screen in front of you: your saturation percentage, heart rate, pulse strength measurements, and a low battery indicator as well. This basic pulse oximeter is child-friendly due to its straightforward design and one button operation. With a simple push of a button and clip of a finger, you can receive all of your blood-oxygen measurements and have it turn off automatically after 5 seconds of non-use. For children and adults alike, this oximeter can monitor your health with the same non-invasive method as hospitals - all in the comfort of your own home.